‘Hanami,’ the Japanese tradition of flower-viewing, is a must-do when visiting Japan in springtime. Today, we’re taking an early look at some of the best spots to see Japan’s cherry blossoms during the hanami season in March. Covering an area of 29.7 hectares, this huge park is also known as “Hyakuju no Mori” for its lush greenery. The trees are surrounded by three ponds, which is where the park gets it name “mitsuike” from (3 ponds), and Yoshino Cherries bloom flowers, gorgeously decorating the waterside. The beauty of Mitsuike Park made it one of the 100 most famous locations for cherry blossoms in Japan. There are 70 varieties of cherry blossoms that flower the environment, from campanulata, which bloom from the start of February, to rarer types such as the yellow ‘ukon’ sakura and yokohamahizakura. The ‘kawazuzakura’ is a natural crossbreed of campanulata and the early-blooming Oshima cherry. This breed has a reputation for flowering before other cherry blossoms. Almost 8,000 trees decorate the Kawazu River around town. The kawazuzakura was also chosen as Shizuoka Prefecture’s number 2 cherry blossom, making this a popular spot for hanami. Sakuma Dam is a place of relaxation and refreshment upstream Sakuma River where you can enjoy hiking and camping amongst daffodils, ume and azalea. Many cherry blossoms bloom there including the early-bloomer kawazuzakura, Yoshino cherry, shidarezakura, and yaedazakura, making a great spot for hanami and a location where you can enjoy the cherry blossoms over a long period. This park is maintained as a place for relaxation where cherry blossom loving locals plant cherry trees. This one’s also home to the kawazuzakura, and since a wide variety of trees are planted, you can enjoy the cherry blossom season even longer. It’s popular as a hidden, tucked-away gem of a location as it rarely appears on maps. Hirano Shrine is famous for its cherry blossoms, a symbol of the enshrined gods’ vitality, which have been around since the Heian Period. 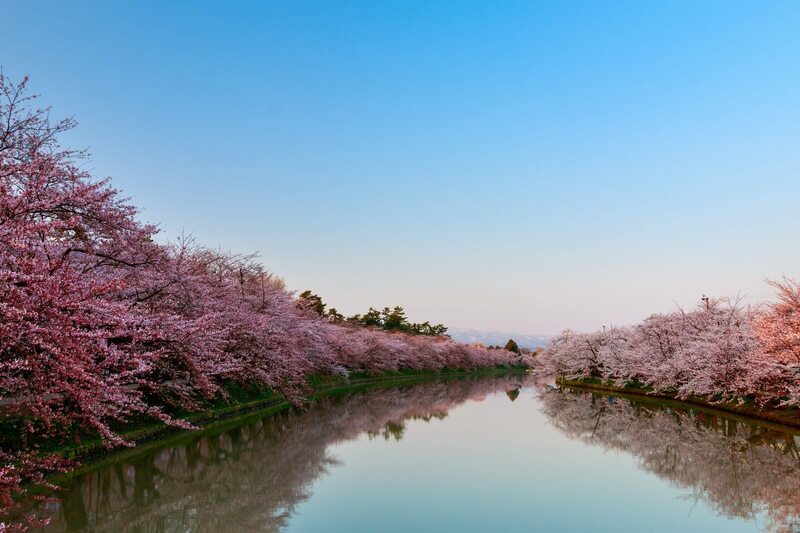 It’s home to 400 trees comprised of 60 types of cherry blossoms. Expect to see the ‘momozakura’ which comes out at the beginning of March, as well as the famous ‘sakigake-sakura.’ The Yoshino will bloom at the end of April, followed by rare varieties that will flower one after the other. Hirano Shrine is Kyoto’s 5th most popular hanami spot. Kigugi-en is a representative garden of the Edo period and designated ‘special place of scenic beauty’ as specified by the Japanese government. When the end of March rolls in, the heart of the garden is in full bloom with shidarezakura, a spectacular view that looks like a running waterfall. The shidarezakura can normally be seen before the Yoshino cherries and are truly a sight to see at nighttime. Did you enjoy our special selection? For full details on the various locations at the cherry blossoms, be sure to visit the webpages (Japanese). ‘Hanami’ is an important tradition in Japan – the magnificent cherry blossoms absolute must-see, so don’t miss out.